Tapered leaders made by brand-named companies are expensive. $4 for a single leader is more than I intent to pay for a fly leader and after looking around for a bit I finally found a cheap and effective tapered leader made by Cortland for $2.50 at the local WallyMart. 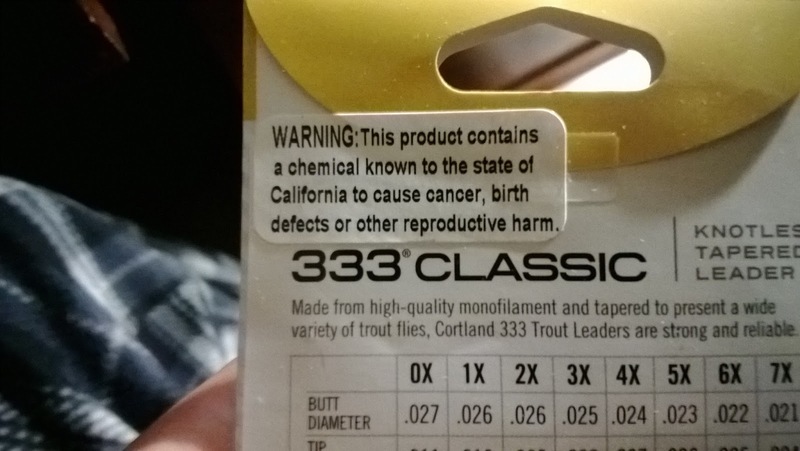 Lead and other harmful chemicals that cause cancer can be found in a lot of fishing products from weights, rods, reels, and lures. Cancer is the second most common cause of death in the nation therefore warning labels like these are a cause for concern. Before you put the product that you were going to purchase back or in your cart, you need to know about California's Prop 65. By providing this information, Proposition 65 enables Californians to make informed decisions about protecting themselves from exposure to these chemicals. Proposition 65 also prohibits California businesses from knowingly discharging significant amounts of listed chemicals into sources of drinking water. Whether or not you choose to purchase the product is entirely your decision. I personally feel that there are other things out there that are more dangerous to anglers than the products we use. For example: harmful UV rays that many anglers don't protect themselves against, dangerous decisions like attempting to cross a river, and not wearing a PFD while boating. Don't let things like a warning label on a simple product like a fly leader get in the way of your fishing adventure. Keep calm and fly fish.